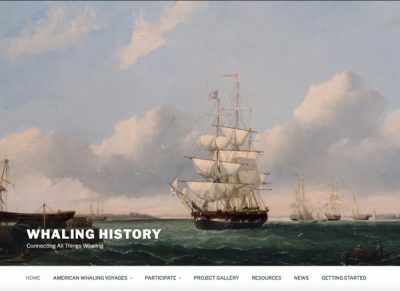 The New Bedford Whaling Museum and Mystic Seaport have developed the world’s most comprehensive whaling history database and it is now available for all to use at whalinghistory.org. Researchers, genealogists, students, teachers, and history buffs alike will find it to be the most robust and useful repository of whaling history documentation and scholarship. The data presented combines many sources including logbooks, journals, ship registers, newspapers, business papers, and custom house records. Users will be able to find and trace whaling voyages and ships to specific logbooks, as well as the list of crew members aboard most of the voyages. The foundational fabric of Whaling History features three databases that have been stitched together – the American Offshore Whaling Voyage (AOWV) database, the American Offshore Whaling Log database, and an extensive whaling crew list database. All data is open to the public and is downloadable for any researcher to use with other tools and systems. The American Offshore Whaling Voyage (AOWV) database, which was spearheaded by Judith Lund, scholar and former curator at the New Bedford Whaling Museum, includes information about all known American offshore (or “pelagic”) whaling voyages from the 1700s to the 1920s. It does not include the modern factory ship voyages of the mid-20th century. Information is most complete for the 19th century. The voyages included in the database sailed from, or were under the registry of, what is now the United States. Extensive records of American whaling in the form of daily entries in whaling voyage logbooks and contain a great deal of information about where and when the whalemen found whales. The second part of the database’s foundation is the American Offshore Whaling Log database, which includes information from 1,381 logbooks from American offshore whaling voyages between 1784 and 1920. These data were extracted from the original whaling logbooks during three separate scientific research projects, one conducted by Lieutenant Commander Matthew Fontaine Maury in the 1850s, the second conducted by Charles Haskins Townsend in the 1930s, and the third conducted by a team from the Census of Marine Life project lead by Tim Denis Smith between 2000 and 2010. The data file includes 466,134 data records assembled in a common format suitable for spatial and temporal analysis of American whaling throughout the 19th century. The third database that Whaling History is built from is extensive whaling voyage crew lists from more than 5,300 voyages. 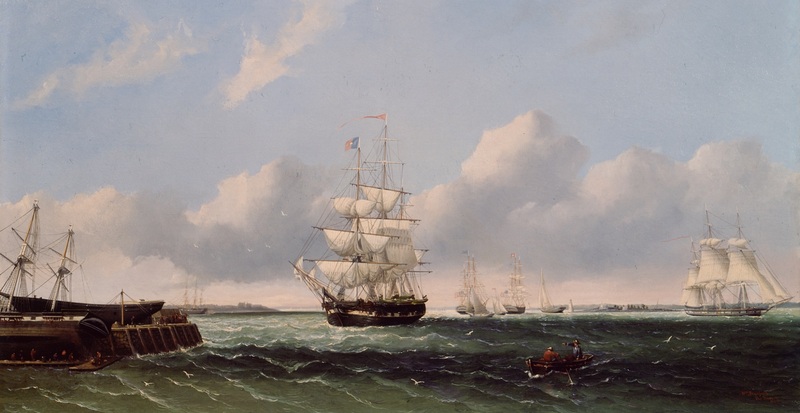 Crew lists for whaling voyages recorded at the customs houses in Fall River and Salem, Massachusetts and in New London, Connecticut have been compiled as part of various projects and from various sources over the years. Crew lists for New Bedford voyages have been compiled using records kept by the chaplains of the New Bedford Port Society from 1840 to the end of whaling in New Bedford. These crew lists are now in a single searchable, sortable database. In the next phase of the Whaling History, museums and other institutions’ collection items will be able to be linked to the database, giving researchers the ability to see a robust and dynamic picture of whaling history and artifacts.